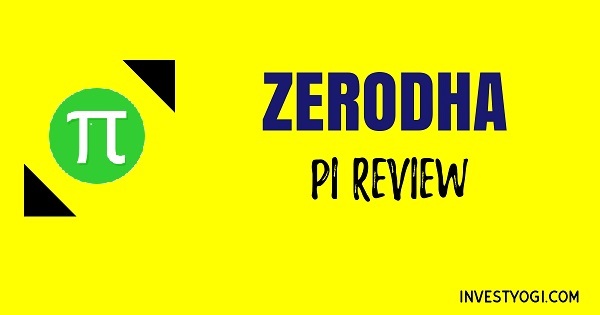 Zerodha Pi is an advanced Desktop trading platform developed by TradeLab Software Pvt Ltd. in association with Zerodha in 2015. Users are required to download and install the software on their desktop or computer. It consumes low internet bandwidth and at the same time, require less CPU and memory usage. Initially, Pi had faced few concerns with order placing, charting & price ticks. Later with software upgradation in mid-2016, bringing in new features and digital advancements, it was turned out as a trusted trading platform. Following are the trading tools available on the Pi platform. Intraday data from June 2014 onwards for the top 200 NSE stocks. Remaining stocks, futures, and Indices from January 2015 onwards. Live & Historical Charts with different time Intervals 1Min/2Min/3Min/5Min/10Min/15Min/30Min/Hour/1 Day/1Week/1Month. 10 chart types - Line chart, Bar Chart, Candle Chart, Candle Volume, EquiVolume, EquiVolume Shadow, Heikin Ashi, Kagi, Point & Figure, Renko, Three Line Break. Backtesting help traders to check their strategy accuracy using historical chart data and even semi-automate them. To backtest, Traders has to code strategy in Trade script Language. Trader can go live on backtested strategies using scripted alerts. Very similar to scripted alerts, but it is easier to run multiple EA’s and sharing with others. Zerodha has shared 14 public EA’s to help get started. Scanner is used to scan on a big group of scrips using TradScript for Semi-automatic trading opportunities. Pattern Recognition is used to find the patterns. For example, head and shoulders, double tops/bottoms, or create own pattern and scan the chart for it. Traders who use AFL (AmiBroker Formula Language) can fire orders directly from AmiBroker into Pi. BRACKET ORDER - A type of order where you can enter a new position along with a target/exit and a stop-loss order. As soon as the main order is executed the system will place two more orders (profit-taking and stop-loss). When one of the two orders (profit taking or stop-loss) gets executed, the other order will get canceled automatically. COVER ORDER - A Cover Order is an order which is placed along with a compulsory Stop Loss Order, in a specified range. This Stop Loss Order cannot be canceled. AFTER-MARKET ORDER (AMO) - Users can place orders for the next trading day any time from 4:00 PM to 8:59 AM (until just before the pre-opening session) for the equity segment and up to 9:09 AM for F&O, and up to 9.59 AM for Commodity segment. Can be installed only on WINDOWS OS. Experience using TrandLines is not that great. Advanced charting without any cost for data is one of the big pluses of Pi. Zerodha Pi uses very low memory & CPU resources. This helps users to trade even with basic configuration. Can transfer funds instantly into the trading account. Conclusion - Technically, PI is top-notch in charting feature and the way it provides the technical analysis for traders. The Back-testing is a great feature for research and technical analysis. In terms of performance, it is considered to be one of the best desktop trading platform.